Consider this charming Amish Pine Farmhouse End Table for your living room, den, office or family room. Stylish and serving multiple purposes, this handy pine table is perfect to incorporate into your country pine furniture or cottage home furniture collection. Our Amish Pine Farmhouse End Table is ready to host and hold drinks, books, magazines, glasses, phones, remotes and more. Display your favorite fresh flowers on this lovely pine table or your favorite family photos. A spacious surface is supported by a lower shelf to hold your items securely. Consider our Pine Wood End Table with Drawer to complement this pine table. At DutchCrafters, we love involving you in the design of your solid pine furniture. 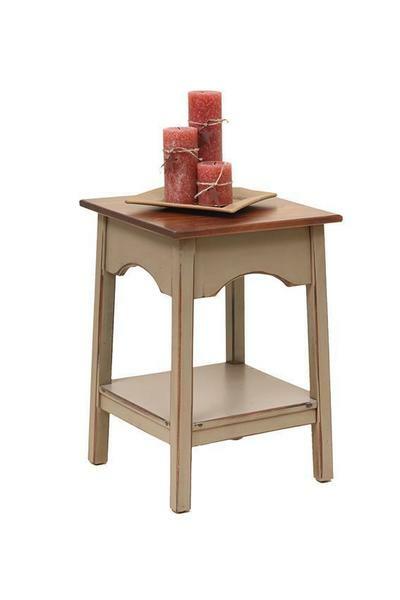 Choose to have your Amish Pine End Table stained, painted or handcrafted with a two-tone finish. Visit our blog for fun ideas for decorating with accent tables.